Stan Shih (Traditional Chinese:Hanyu Pinyin:. Shi Zhenrong, December 8, 1944 in Lukang Township, Changhua County, Taiwan) is a retired business tycoon Taiwan. 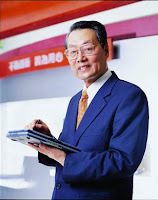 After receiving a bachelor's degree and a Masters degree in Electronics Engineering from National Chiao Tung University, Shih founded Acer (originally named Multitech, but later changed to Acer in 1987) in 1976 with his wife, Carolyn Yeh and a group of five. Acer's Shih chaired until his retirement late 2004, saw Acer grew from a small start-ups with brands around the world billions of dollars. After retiring Shih is still active in local charity work, and even appointed as Special Representative of President Chen Shui-bian to the APEC Australia 2007.